More than a tonne of waste will be dumped in Swindon Town Centre to highlight the huge cost of clearing up flytipped waste across the Borough. The waste will be left in Wharf Green at 7am on Monday (20 March) to grab the attention of passers-by on their way to work. 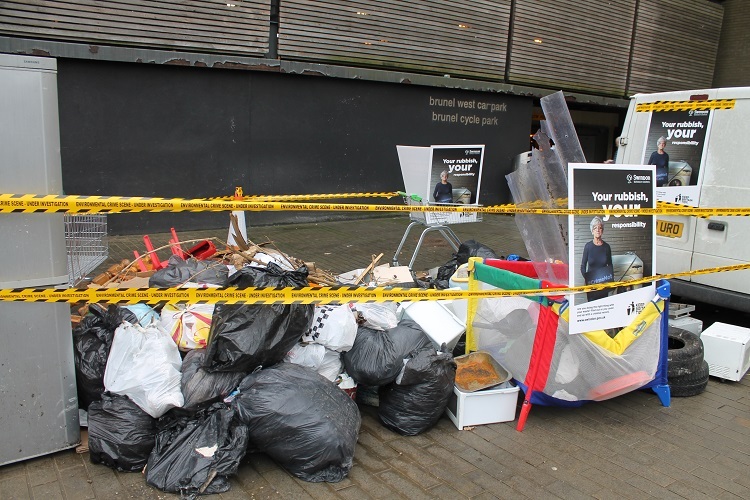 The publicity stunt has been organised to raise awareness of the campaign to tackle the epidemic of fly-tipping that is affecting communities up and down the country and will support the national #CrimeNotToCare campaign co-ordinated by environmental charity Keep Britain Tidy. The ‘rubbish’ – in the form of white goods, furniture and general waste - represents the types of items regularly fly tipped, and will remain on site until 3pm. Staff from the Swindon Borough Council’s ‘Envirocrime’ team will be on hand to meet visitors, explain the problems occurring around the Borough, and hand out leaflets. In Swindon, annually almost 3,000 cases of fly tipping are reported each year, costing council taxpayers up to £250k per year to clean up. #CrimeNotToCare, being run in partnership with Keep Britain Tidy, aims to educate householders about the right thing to do with their rubbish and to reduce the amount of household waste that is fly-tipped by rogue traders who offer to take people’s waste away for money and then dump it. The campaign aims to get the message across graphically that if an individual’s waste is fly-tipped, even if they gave it to a third party to dispose of, they can be prosecuted and end up with a fine and a criminal record. “In Swindon alone we collect over 3 tonnes of fly-tipped rubbish every week costing us a quarter of a million pounds annually to clean up – that’s money we can’t spend on other vital services in the Borough. So I’m delighted that the Council is fully backing Keep Britain Tidy for this critically important campaign. “I would encourage people to come along to Wharf Green and see for themselves the impact of a large fly-tip in a neighbourhood. And take the chance to meet our team and find out what they can do to help tackle the problem, which affects all of us. “The Council now has the power to levy fixed penalty notices for fly-tipping and we will have no hesitation in doing so. I would encourage anyone who spots fly-tipping or has suspicions to contact us without delay”. Swindon Borough Council regularly gives educational talks in local schools to encourage children not to drop litter and recently ran a competition with primary schools to build on this work. Our Envirocrime team, which has been operating since last July, has issued over 175 Fixed Penalty Notices for littering and trade waste violations. The team had also carried out over 280 investigations into reports of fly-tipping, waste and littering and 12 files are being prepared for prosecution. “#CrimeNotToCare is an important campaign for our country and we are delighted that Swindon Borough Council is partnering with us on it. “There are almost a million fly-tipping incidents in England every year and cleaning it all up costs us more than £50million a year. It blights communities and our countryside and is a menace. “We need the public to understand that their rubbish is their responsibility and they must do the right thing with it.